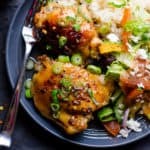 Slow Cooker Thai Chicken Thighs Recipe made with 2 ingredients: healthy homemade thai sweet chili sauce and chicken thighs. BEST easy healthy chicken! Preheat nonstick ceramic skillet on medium heat and place half of the chicken skin side down. Cover (mostly to minimize fat splattering) and cook until skin is crispy brown, about 4-5 minutes. Turn, cook for another 3-4 minutes and transfer to a large slow cooker skin side up in a layer. Drain fat from skillet and repeat this step with remaining chicken. Pour Thai sweet chili sauce on top, cover and cook on Low for 5-6 hours or on High for 2.5-3 hours. Serve hot garnished with green onions, a side of brown rice/quinoa and a salad of choice. That is it! Store: Refrigerate in an airtight container for up to 5 days or freeze for up to 3 months.